The video work Masquerade by Vermeir & Heiremans will premier at the Triennial of Bruges, which runs from May 20 until October 18 2015 at various indoor and outdoor locations in Bruges. The 2015 Contemporary Art and Architecture Triennial of Bruges examines the different aspects of global urbanization together with internationally renowned artists, architects, scientists, curators and the general public. The Triennial additionally explores the notion of "megacities", defined by the United Nations as an urban agglomeration with a population of 10 million or more. In 1975, there were only three of these, while today there are thirty one. Exploring this development, the Triennial hopes to fuse both historic and futuristic images of cities in order to create interesting artistic encounters and confrontations. In their collaborative practice Vermeir & Heiremans focus on the dynamics between art, architecture and economy. In this practice the artists define their own home, a loft apartment in a post-industrial building in Brussels, as an artwork. Whilst keeping their home private, they use it to create “mediated extensions”, translations to installations, videos, performances, publications... that generate a public hyper-visibility for their domestic space. Art House Index (AHI–) is a new “extension” that proposes the transformation of “the home as an artwork” into a financial instrument. The potential value of this index would be its ability to render an opaque static product that is difficult to trade, like a house or art, into a transparent tool of measurement that is very accessible for many investors. 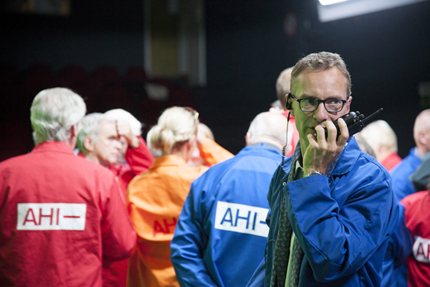 In their new film Masquerade, a TV-reporter is telling the story of the protested “initial public offering” (IPO) of (AHI–). While she is addressing the camera, what appears to be a reconstruction of the IPO is taking place in the background. And then it all starts going wrong again! 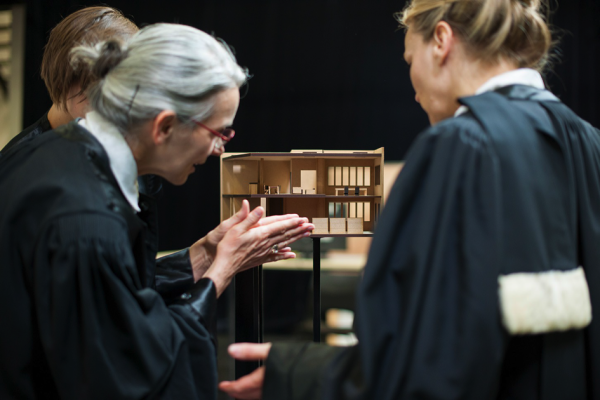 Is the audience witnessing an insider-sales in an auction house, a crash in the market or is it a hearing in a courtroom, one that tries to unveil the intricate dynamics of a confidence game? Art, like finance, is a system of belief and their markets are where this belief is put to work. The ephemeral worlds of “high finance” and the “global art markets” thus offer a unique context for the narrative of Masquerade. It is set in a fragmented environment that gradually evolves from a gallery white cube to an auction house, commodity exchange, trading pit, even a courtroom... all places where values are negotiated and exchanged. Masquerade is presented in the green key film set in which it was shot. The actual performance of AHI– references tools for measurement of confidence and belief, while its calculations trigger a switch between two video timelines, one of which shows the “finished” film while the other captures variations, rehearsals and failures. Incorporated in the multiple screen video installation is In-Residence Magazine # 02, an artist publication in the form of a lifestyle magazine, which offers background information on the concept of “value” in the worlds of finance and contemporary art. Masquerade is a video installation by Vermeir & Heiremans realized in collaboration with Andrea Phillips, Werner Van Steen, Justin Bennett, Amir Borenstein, Jan Misker, Michael Schmid, Salome Schmuki, and with Mon Bernaerts, Philip Brackx, Hans Bryssinck, Gaia Carabillo, Ludo Engels, Ciel Grommen, Elien Hanselaer, Nav Haq, Mieja Hollevoet, Liliane Keersmaeker, Heike Langsdorf, Dieter Leyssen, Karlijn Sileghem, Peter Sileghem, Fatos Ustek, Sun-Mee Vanpanteghem, Mi You and many others. Photography: Michael De Lausnay.